From the title of this post alone, most experienced warlocks will probably already know what I’m going to talk about today. 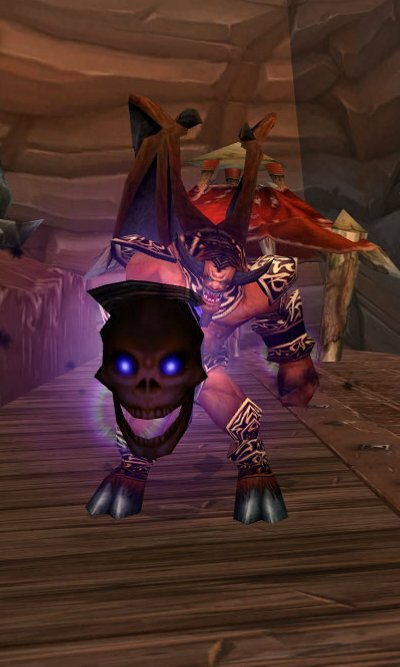 However, if you’re a newer warlock who’s just now beginning your ascension into the Dark Arts of warlocking, then you might not be familiar with our Doomguard minion. The good news is that there isn’t too much to learn when commanding this demon in your arsenal for enhancing your dps. As with all good opportunities to increase your damage, the real skill and art about using your Doomguard is mastering good judgment for finding the best time to call him into battle. What is a Doomguard? Besides the normal demons we command, warlocks also have the spell Summon Doomguard. It’s a single button push spell that I like to call “The Big Red Button” that summons this monster of a minion to battle next to you for one minute. 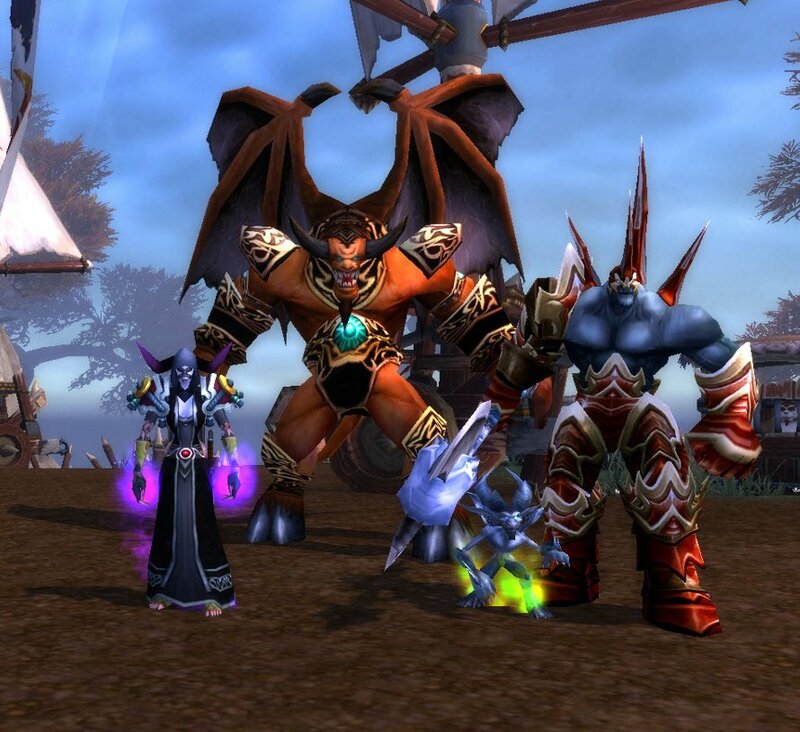 Besides his good looks and imposing figure, the Doomguard is a nice boon to our single target dps. An easy way to understand and to think about your Doomguard is to view him as a single target trinket that you’ll never have to replace. I’m sure many of the more experienced locks will agree that even though the Doomguard is a single button press, it’s still exciting to call him out for several reasons. The first reason the Doomguard is fun, is because you don’t summon them very often. A skilled warlock should be vigilant in constantly looking for the right opportunity to use their Doomguard during a fight. When a strategic time does occur, trust me when I say that you’ll be gleefully cackle laughing as this horror is blasting away at your foes. The second reason Doomguards are exciting is because we know that when the “Big Red Button” is pressed, it’s usually at the turning point of the fight and that’s the nail-biter moment, when you need to unleash everything you got to win or turn the tide of battle! Woot! Big red button push ftw! 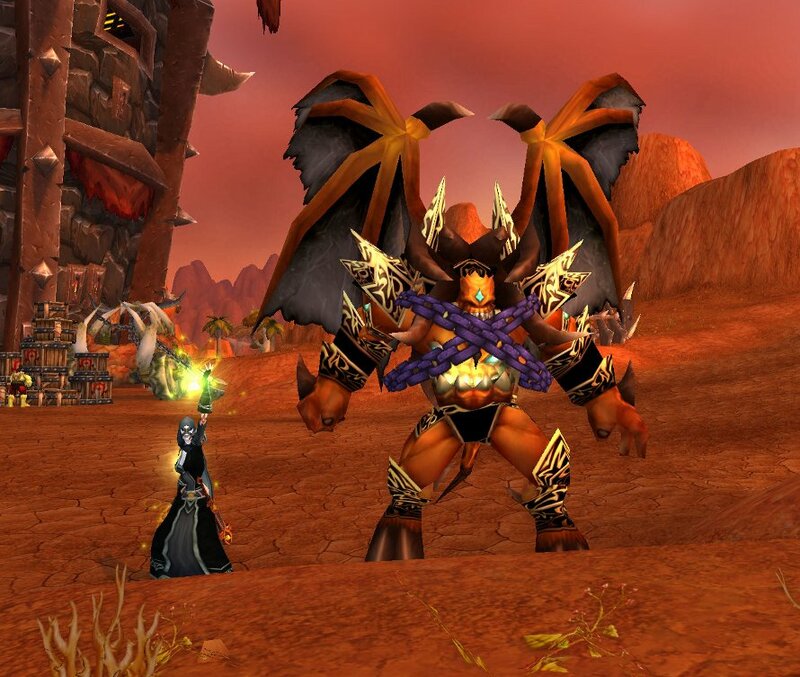 The Summon Doomguard is an instant spell that has a 40 yard range on a 10 minute gcd which summons a Doomguard to attack your target that is afflicted with Bane of Doom or Bane of Agony for 45 seconds. When summoned, the Doomguard will appear by your side and attack your target inflicting extra damage to your enemy with his single dps spell called the Doom Bolt. He will continue to attack your enemy until either the target dies or his 1 minute timer has expired. The idea behind the Doomguard sounds simple enough until you consider his 10 minute global cool down. As you can see roughly the Doomguard’s additional damage over 1 minute can range from 190k to 228k depending upon the level of your target’s health. Sadly, I wasn’t able to test to see if the numbers would change from a target that went from 25% to say 15%. I’m sure it’s safe to say that the additional 20% damage would kick in when the target reached the <20% mark. I’ll update this post when I find out. If a warlock chooses the Grimoire of Supremacy talent at level 75, the old Doomguard becomes upgraded to the new Terrorguard. Through this talent, the new Terrorguard will have 20% more health and do 20% more damage than the standard Doomguard. Other than the Terrorguard’s new appearance and higher numbers, he and the Doomguard, both work the exact same way. Both are at their best when it’s a single target burn. Summon Terrorguard – An instant 40 yard range spell that Summons 1 Terrorguard to attack your target for 1 minute. The Terrorguard will cast Doom Bolt until it departs. The Doom Bolt is the only damaging spell this big guy will cast. It has a 30 yard range with a 2.81 second cast time that sends a bolt of energy at the target causing 10,859 shadow damage. It will also deal 20% more damage to targets below 20% of health. The Terrorguard as seen through the Eye of Kilrogg. The chains are a nice touch, however it covers up his face and the scary mouth in the stomach animation. When should you use your Summon Doomguard or Summon Terrorguard spell? Of course, the obvious choice would be to utilize the Doomguard or Terrorguard on a burn phase of a boss, or on a boss that has less than 20% of health. It sounds easy enough, but like all encounters in heroic dungeons, in PvP, and in raids, sometimes the choice isn’t always the most obvious one. What about bosses that you need to push to their next phase and your team is almost, but not quite getting him there? 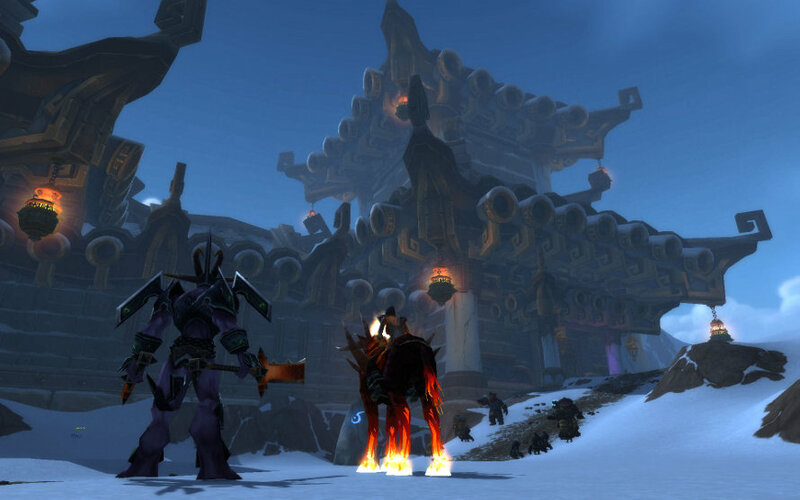 What about those times in a LFG when things can go awry and the added dps can mean the difference between keeping it together or having a wipe fest? How about an advance on the enemy flag carrier? How about a massive zerg on capturing a node? As you can see, your choice of when to call forth your guard can be varied and situational. However, there are a couple of things to consider. A dead warlock = no summoned Doomguard/Terrorguard and no dps burst. I’ve been in a few fights where the raid was dropping quickly and nothing could save the group, only to watch a fellow ‘lock toss this guy out for less than 10 seconds. The warlock died and then the demon faded away without his master. It was a nice thought and a nice try, but it didn’t down the boss or save the raid. On the next attempt at the boss, this warlock’s Doomguard was still on the global cooldown and could not be used. Maybe I’m stating the obvious, but I’m sure you can see that it’s a good idea to make sure you’ll be alive to get the most value from this minion. With enough experience, you’ll come to find when it’s the best time to summon a guard for the greatest benefit for your play style, for your team or for your raid, so experiment and see what works for you. Really Amijade? You’re telling me not to forget to use this spell? Yes, I am. It sounds simple enough, but in the heat of battle when things are going crazy and you find yourself flustered or frustrated anything can happen. On several occasions, I know I for one have forgotten to use this spell when I could have knocked it out of the park. With a 10 min gcd it’s easy to forget if it’s up or not. I’ve had several honest warlocks tell me they forget about it as well. Trust me, it can happen. So keep a cool head, don’t die and remember to use this ability! A 10 minute global cool down is a terrible thing to waste, and as we all strive to be better players and better warlocks, I want you to learn from the mistake of myself and others. Trust me when I say that sharing knowledge of the Dark Arts can be enlightening, if not humbling. Ah Doomy. I love this guy. I remember the days, when he wasn’t a pet, but a nuisance that only spawned from a perfectly (or badly) timed Curse of Doom. Ugh. Nothing worse than killing the boss, to have your doomguard spawn, then take out a few dungeon members because you can’t find the ‘enslave demon’ spell in the spellbook. I think this guy got his most playtime in Tol Barad. I’d spawn him right after that one boss threw out the “ahh fire on the ground” phase and you needed to burn down quickly before it happened again. Seldom has he ever saved my life in dungeons by pulling the mob off me. I know once, he pulled aggro off me long enough to battle rez the tank using a stored soul stone. Yeah, I wasn’t sure if I should have talked about how it formerly proc’d off a death from Doom or not. Since most folks will have no idea that used to be the case I left it out to keep it simple. I already suffer from TL;DR in all my posts so I didn’t bring it up :) Nice to see others remembering that too. 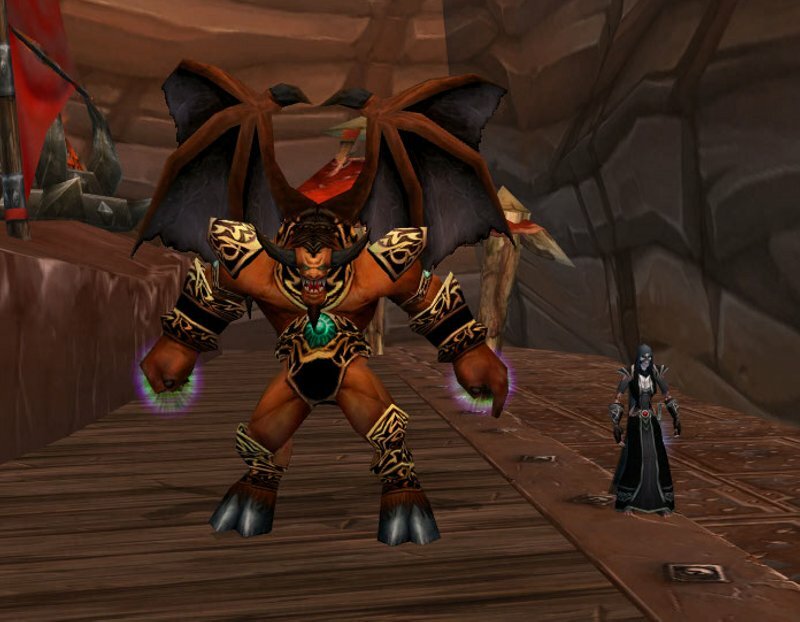 I also remember running around just to see which demons I could command with Enslave Demon to see which I liked best. My only problem with the Doomguard is that he’s still got that glitch where sometimes when you summon him, he is standing right on top of you. Example: “I stood in wha? Oh, sorry I had a Doomguard on top of me”. Thanks so much for commenting and I’m glad I could help in some small way. The trick with being a good ‘lock is understanding your true birthright and honing your skills to best serve you like your demons. Believe it or not, I really can’t teach anybody anything. I can only show you the door. You simply have to find the true power within yourself to grasp it. Have you ever seen one of those 3D posters? You know the ones where from far away it looks like a crazy pattern? Then when you focus at just the right angle you suddenly see a hidden 3D image inside the pattern emerge as clear as the nose on your face? It’s like that my friend, trust me on that one. And please, feel free to comment anytime you like. My best!